Dave Tate of EliteFTS came to CrossFit San Diego for a private seminar on January 24, 2009. Dave was a successful competitive powerlifter for over two decades. He trained with Louie Simmons at Westside Barbell Club. His best back squat was 930lbs, bench 610lbs, and deadlift 740lbs. Tate is a powerlifting specialist, and he doesn’t claim to be anything else. This is the first video in a series from that seminar. Topics in the series will range from training philosophies, powerlifting techniques for the squat and deadlift, and Dave’s approach to a successful life. 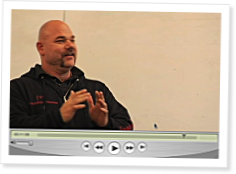 This video starts with an introduction from Coach Glassman, and then Dave talks about his background and the basic story of how he became successful. While injuries are a part of any sport, they don’t have to happen all the time. Very interesting. Looking forward to the rest. I am amazed that Dave's max squat is so much greater than his deadlift by nearly 200 lbs! Is that common in the powerlifting world? Often that is the case in Powerlifting when equipment is involved (deadlift suit, squat suit etc.). Reason being that squat suits can be much tighter, thicker (multiple ply), and more restrictive because the weight helps you down into the whole. The deadlift suits can't be as tight, thick, or restrictive becasue it would prevent you from reaching down and grabbing the bar, and thus you may not get as much aid out of a dead suit. This is just one variable. Some people do just naturally have higher squats than deads. This is definitely not the case for me though. Not sure if this has any validity or not, but at such high weights grip strength might be the limiting factor. I sometimes feel like my legs could push more but my hands cannot grip the bar during deadlifts. (I find this more for repeated heavy deads than heavy singles though.) With the squat, the bar is always resting on your shoulders/back, so you don't require those small wrist muscles. Small being relative, as anyone who can pick up 740 probably has wrist muscles bigger than most mortals' biceps/triceps. "The people who know a lot, know about one realm"
I enjoyed his candid honesty. This is a man that knows a lot about power-lifting and muscle gain, and only give advice in those two fields of training. I like that CrossFit HQ is bringing in more experts. Rob Wolf for nutrition, Burgener for Oly lifts, Mackenzie for running technique, Tucker for gymnastics, Rippetoe and Starr for barbell strength. I'd much rather learn from a man that has spent all of his life focusing on one thing, an expert with years of experience. thats a cool intro. im gonna share this one with the kids at work tommorow. smurf it up indeed. Smurf it up indeed! I like this guy. Imagine that, Coach finds an interesting and dynamic individual with a library of knowledge between their ears and he gets them to present at a seminar. I'm always impressed by the caliber of people that coach assembles, from the HQ staff to the specialty coaches (Bergener, Ripp, Wolf etc). I’m always confident when I endorse crossfit because it is awash in quality inputs. I look forward to more input from Dave. As it is he has already given me a new coaching angle. Whenever I have an athlete stuck in the hole on a heavy squat I’m going to scream ‘Smurf it up’! I've followed you on other .com's, and I'm glad you're here to help this community... Started in 1983 huh? Good year- year I was born. If this presentation was what he considers "rusty" then I want to see him at his peak. Coach, you gotta give us more of this guy right now. Been looking at elitefts for a while now. Great articles filled with advice and learning opportunities. I look forward to seeing more of you on the xfit web. Dave Tate is one of THE go to guys in the powerlifting world - and as a competitive powerlifter and crossfitter I am SOOOO happy to see him here. Looking forward to more great stuff from him. This is great for the CrossFit community. Dave Tate, and the people at Westside Barbell, are the elite in their sport. It is proper to surround yourself with the best people, and Dave Tate is the best in that regard. Good job Glassman. These videos have provided priceless advice/tips for instructing newbies. The stuff from Coaches Burgener and Rippetoe are the information I provide my police recruits. NO ONE has been injured as a result of practical application of strength training, and everyone has gotten stronger. Keep the experts coming, Coach Glassman. Thank you! I was blown away to see Dave Tate! Listen and learn, watch his videos on youtube. Welcome Dave! It is so nice to see guys like Tate contributing to the community! Elite FTS and Westside are rich sources of quality information in their field. Look forward to seeing more progression and contribution f/ experts like Dave Tate! Crossfit is so good and adapting and absorbing from the best! Incredibly motivational, and a true testament to setting your own course. From my experience that is what I have seen in business as well. Go Ohio! Lived in Columbus at OSU and Franklin for years and never took advantage or even knew what was happening at Westside. I am sure Ohio will make a strong showing at the Games this year, if not sweep the mens and womens divisions. Having Dave to contribute to CF will be awesome. This man has a VERY, VERY unique mindset regarding powerlifting and business - both of which are great assets to the CF community. I've known Dave for a while and a TON of my info came from EFS and the countless articles and q & a members. of powerlifting and dave's biz mindset - some seriously awesome stuff! This is awesome, Coach G is a VERY smart man for this move!